The very rich, pampered, adult children of American billionaires living very privileged existences on America's Long Island have been experiencing a series of kidnaps and being held to ransom recently. With this worry in the background, Charlie (short for Charlotte) Fox, bodyguard and ex-British Army Special Forces soldier is sent by her boss to protect the rather naive daughter of an investment banker from becoming the "fifth victim". Following a couple of rather amateurish attempts, to kidnap the daughter and noticing the rather peculiar behaviour of some of the client's close friends, Charlie begins to strongly suspect an inside job. On a previous job, Charlie and her partner Sean Meyer were fired upon and Sean was badly hit and left for dead and has been in a coma ever since. Charlie tries to visit Sean in the Manhattan, New York medical facility where he is, as frequently as her schedule allows, but his non-responsiveness to treatment is a great worry and her work as a bodyguard acts as a welcome distraction from what to do next. The boss of the Close Protection firm that Charlie works for, keeps a thorough check on her to ensure that she is not isolated by the unwelcome attentions of her client and her brattish friends. When a kidnapping does occur, as the clients are emphatic about not wanting publicity, the Police or FBI involved, Charlie's boss brings all of his company's vast experience of hostage rescue into the picture. The story leads on with nail-biting, fast-paced suspense to an absolutely unexpected ending. FIFTH VICTIM is a very detailed, but well plotted and researched book and the author shows great familiarity with the New York and Long Island areas, where all of the action takes place. 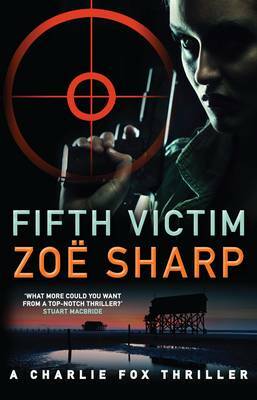 Her fourth title in the "Charlie Fox" series of ten books, FIRST DROP, was nominated for 2005 Barry Award for Best British Crime Novel and Sharp's heroine 'Charlie Fox' is often described as a female Jack Reacher. I thought this book was absolutely stunning and could not put it down. I will certainly look out for her name in the future and her previous books also. Recommended. Read another review of FIFTH VICTIM.